At its core, machine vision is a vast puzzle of algorithms and computer code. The end results, however, are more easily understood, as are their real-world applications. Radke’s work holds the potential to impactand even shapethe future of how humans utilize and interact with technology. Uncovering the wonders of lighting innovation is the focus of Rensselaer’s acclaimed Lighting Research Center (LRC), which over the last 20 years has built a reputation as the premier academic institution of its kind in the United States. When Jim Shaughnessy ’55 took his camera to Troy’s Union Station in the winter of 1946, he wasn’t planning to reinvent railroad photography. He was simply 13 years old and curiouscurious about steam engines and about how to capture their power and grandeur on film. 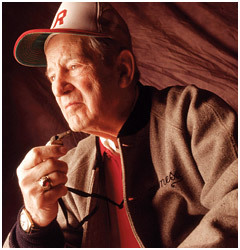 Rensselaer lost a legend when Ned Harkness died Sept. 19 on his 89th birthday. Harkness coached RPI hockey and lacrosse teams to national championships, becoming the first coach in NCAA history to win national titles in two sports. It took an uncommon man to mold rookies into champions, and those who played for him were transformed for life.